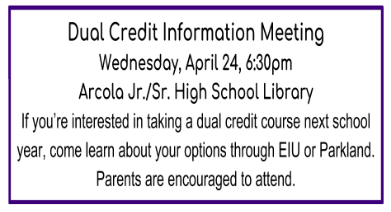 Dual Credit Information Meeting: Wednesday, April 24, 6:30pm in high school library. Interested students and their parents are highly encouraged to attend. Email Mrs. Mendez (amendez@arcolaschools.com) or Mrs. Phillips (aphillips@arcolaschools.com) with questions. COPYRIGHT © Arcola CUSD #306 2019. ALL RIGHTS RESERVED.